New Zealand to the south-east." 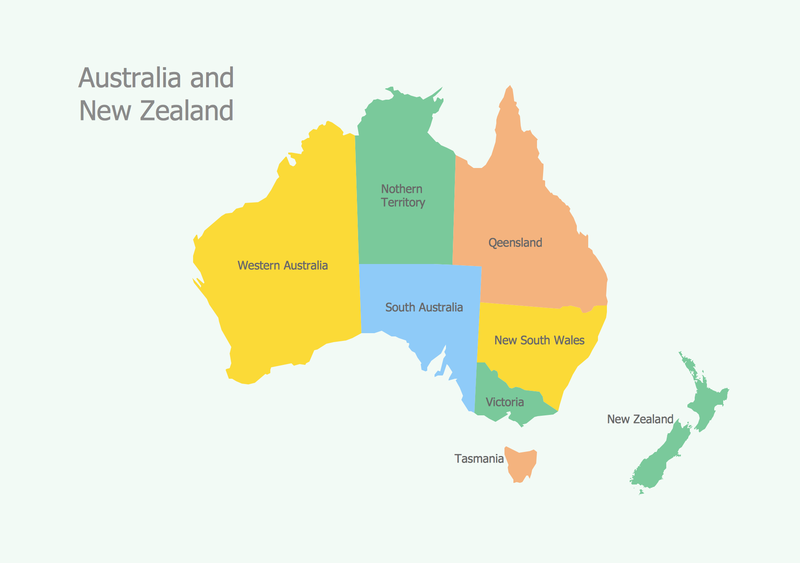 The vector stencils library Australia contains contours of New Zealand and Australian states and mainland territories for ConceptDraw DIAGRAM diagramming and vector drawing software. This library is contained in the Continent Maps solution from Maps area of ConceptDraw Solution Park. 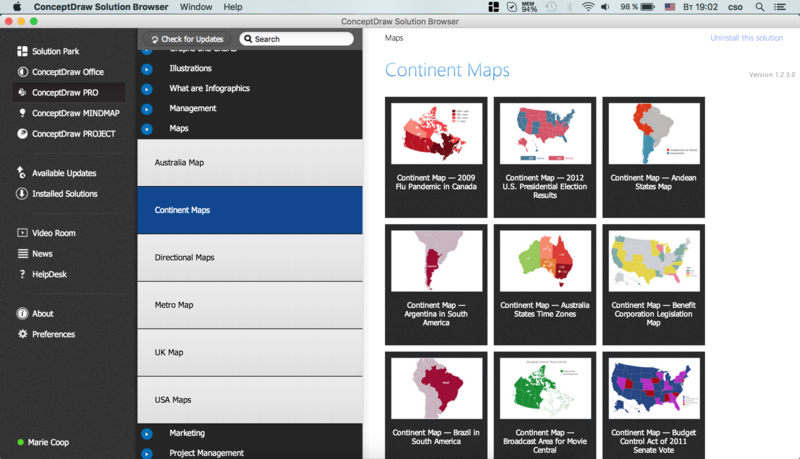 Use the Australia library to draw thematic maps, geospatial infographics and vector illustrations for your business documents, presentations and websites. Australia has six states — New South Wales, Queensland, South Australia, Tasmania, Victoria, Western Australia and two major mainland territories — the Australian Capital Territory and the Northern Territory. Australia has a population of over 24 million and an area 7,692,024 km2(2,969,907 sq mi). 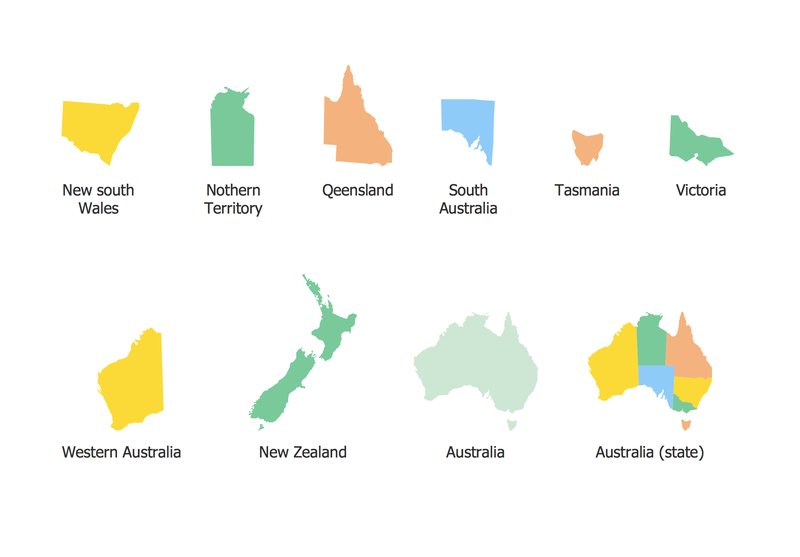 Use the map contours library "Australia" to design thematic maps using the ConceptDraw DIAGRAM diagramming and vector drawing software. 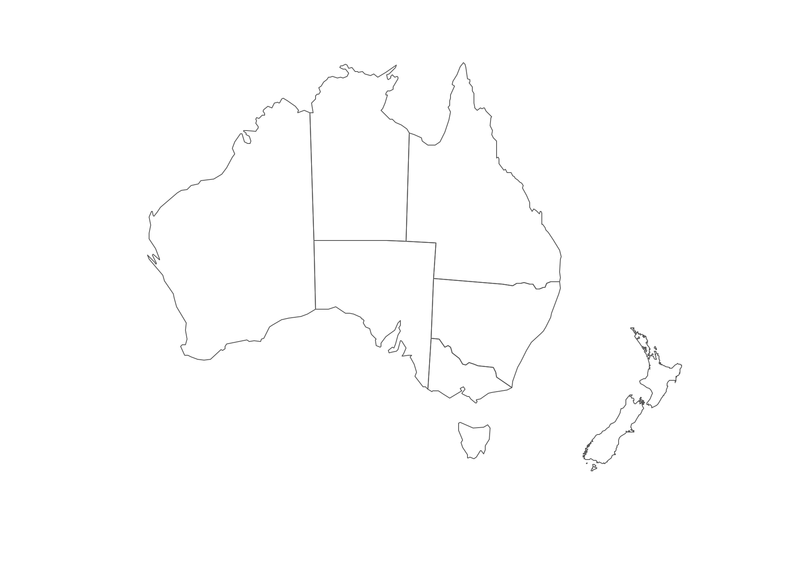 The vector stencils library "Australia" contains 10 map contours: Australia political map, map contours of states. All ConceptDraw DIAGRAM documents are vector graphic files and are available for reviewing, modifying, and converting to a variety of formats: image, HTML, PDF file, MS PowerPoint Presentation, Adobe Flash, MS Visio (.VDX, .VSDX). The vector stencils library Australia contains contours of the Australian states and mainland territories for ConceptDraw DIAGRAM v12 diagramming and vector drawing software. The vector stencils library Australia contains contours of New Zealand and Australian states and mainland territories for ConceptDraw DIAGRAM v12 diagramming and vector drawing software. South Australia (abbreviated as SA) is a state in the southern central part of Australia. It covers some of the most arid parts of the continent. Victoria (abbreviated as Vic.) is a state in the south-east of Australia. Victoria is Australia's most densely populated state and its second-most populous state overall. Tasmania (abbreviated as Tas and known colloquially as "Tassie") is an island state, part of the Commonwealth of Australia. Bulgaria, officially the Republic of Bulgaria, is a country located in Southeastern Europe. Use the Continent Maps solution to create Bulgaria geographical map, cartograms and thematic map, to help visualize the business and thematic information connected with geographic areas, locations or customs. Western Australia (abbreviated as WA) is a state occupying the entire western third of Australia.